Woo Hoo - Someone's turning 4 years old!!!! Time to celebrate! 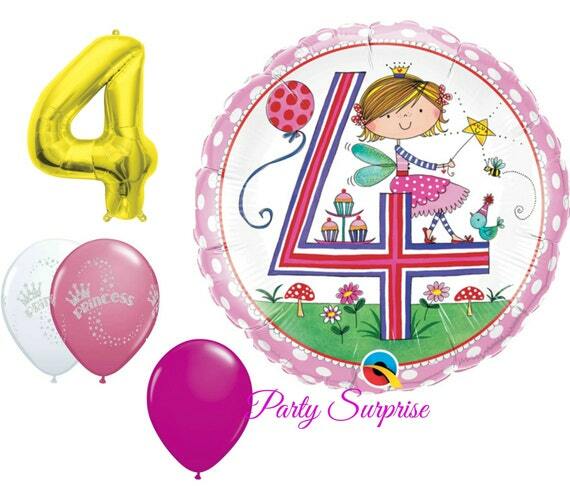 * From designer Rachel Ellen Collection, Number 4 round mylar foil balloon, with an sweet fairy princess making a gentle appearance. Inflate with helium to 18"
* Pink and White Glitter Princess balloons. Made of latex by Qualatex, inflate with air or helium to 11"
* Solid pink wild berry balloons. Made of latex by Qualatex, inflate with air or helium to 16"
Select your package from the DROP DOWNS in the order box. Scroll down HERE for package details. Same low shipping price on all packages. 3 Number 4 mylar 18"
18 Glitter Princess latex 11"
5 Pink wild berry latex 16"
2 Number 4 mylar 18"
12 Glitter Princess latex 11"
3 Pink wild berry latex 16"
1 Number 4 mylar 18"
6 Glitter Princess latex 11"
Don't forget your fancy straws, mini popcorn boxes, gift boxes, Euro gift bags, gift/favor/treat bags, tissue tassel garlands & balloon tails, custom wedding confetti wands, disposable cutlery, cake toppers, and cupcake toppers & wrappers - I have what you want! Do not leave with children who are unsupervised due to choking and suffocation hazard.